Since Tomo was busy on Sunday, Jess and I spent our last day in Tokyo wandering around Meiji-jingu and Harajuku. Since I’ve written about Meiji-jingu before, I won’t spend much time on it here, other than to say it was a beautiful day and quite crowded with people. On the way back from the main shrine complex, Jess and I decided to visit the Gyoen, or “Inner Garden” of Meiji-jingu (which will cost you a whopping 500 yen). 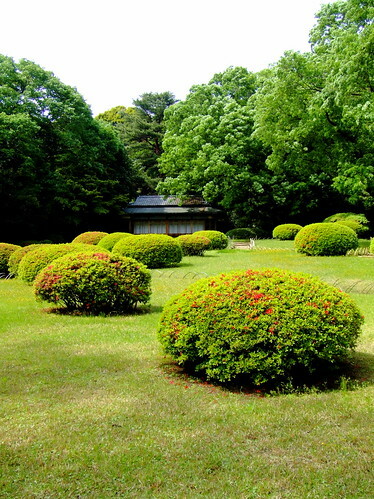 The Gyoen fell under the control of the Imperial Household during the Meiji era, and was renamed Yoyogi Gyoen (Yoyogi Imperial Garden). It’s most famous for its iris garden, which comes into bloom in June. There’s really nothing incredibly special about this garden, which is part of what makes it so nice to walk around in. The crowds at Meiji-jingu are absent here, and the landscaping is fairly minimal so it feels more like walking through a forested area than a stylized Japanese garden. I imagine that in June, when the irises are in bloom, that it’s absolutely packed with people, but in the off-season it’s really nice and quiet. Here’s a view of the teahouse that overlooks the pond. This is the most cultivated area of the garden, aside from the iris beds. 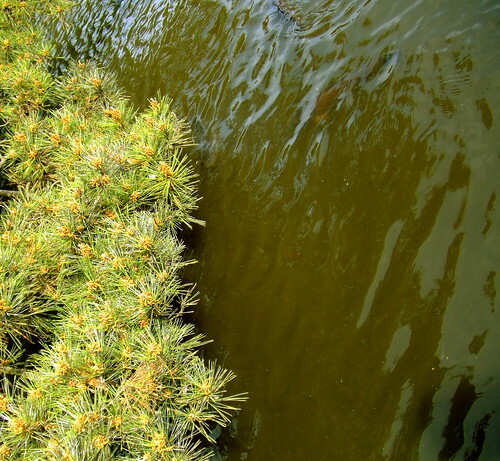 Here is a picture of the pond taken from a pier that used to be used for fishing. I suspect that fishing is no longer allowed. 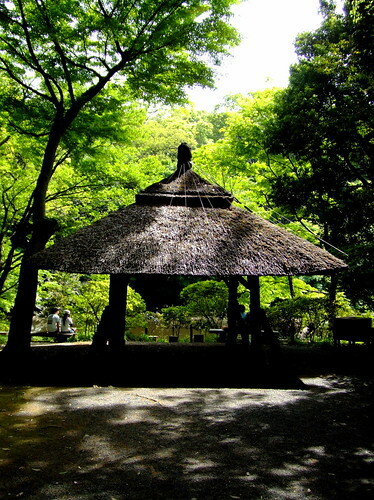 The iris garden winds toward Meiji-jingu following the path of a stream bed. 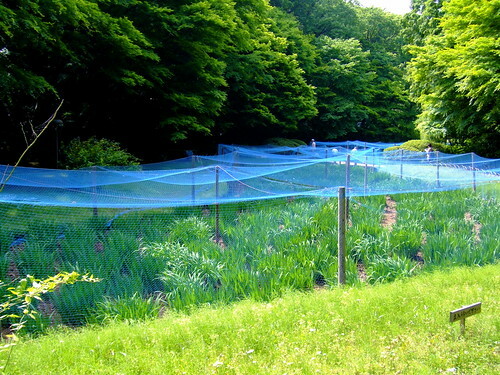 Here the irises are covered with netting to protect them. In fact, this view reminds me a bit of a Christo project. There are hundreds of kinds of irises here, each particular flower labeled with a small, wooden sign. 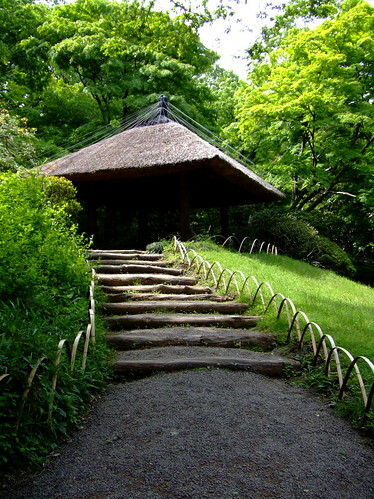 The garden also has several of these thatched roof rest areas. On the day that we were there, many of them were populated by small groups of bird watchers with enormous camera lenses.